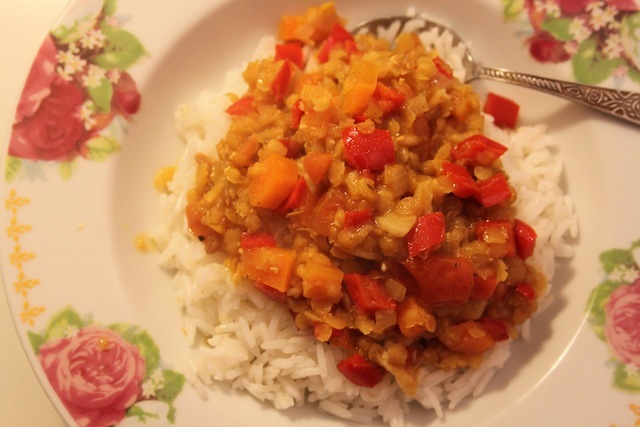 If on a Winter’s Night: Easy Winter Lentil Stew – Eat Me. Drink Me. Some days it rains and in the coffee shops the crowds grow a low murmur. Outside, the smell of damp leaves and everywhere, I swear, I smell a roasting turkey. I’m reading a book of short stories by Italo Calvino and at the same time a Harper’s magazine from May I’ve been working on for months. In the news, it’s a blur of politics and hurricanes and I wonder what I’d be doing in New York if I were still there. I think of my McKibbin apartment, where I didn’t close up the three-inch hole in the window with duct tape until winter. What I most look forward to are afternoons wrapped up in a blanket and my love, a movie laughing in the background and sleep in my limbs. Don’t tell anyone, but I like these days. The damp, the leaves, the candles lined up on the windowsill. The snuggled in slippers, the garish green hat. When I cook on nights like these, I cook for comfort. I want the seeping smell of garlic and spice. I want to feel the thin skin of a tomato crack beneath my knife and hear the familiar sound of a peeler’s swish against a carrot. And when I eat my stew, I want it to mean the day is done. The shutters can be let down and soon, soon, I can go to bed. 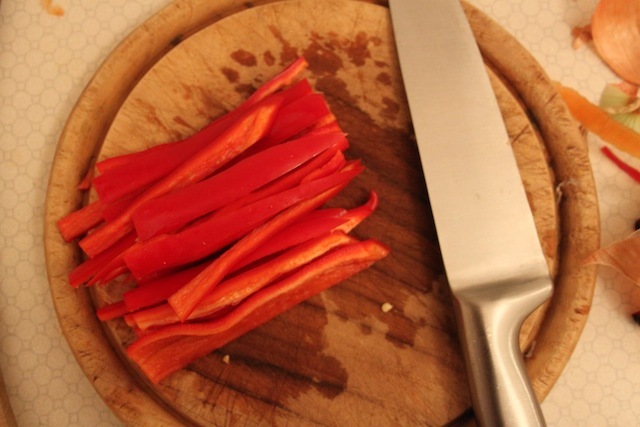 Finely chop onion, carrot, and peppers. 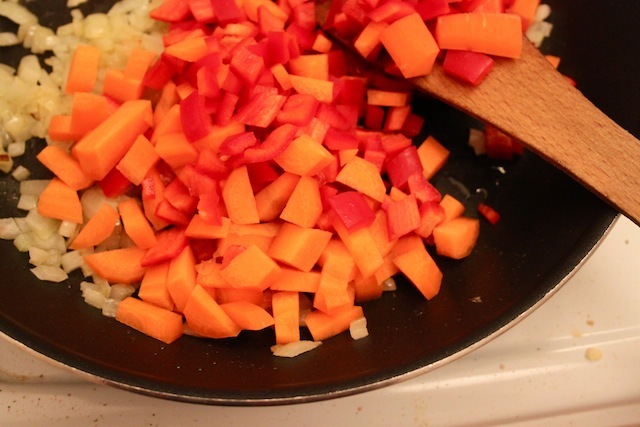 Heat olive oil in a skillet and sauté onion until translucent, then add carrot and peppers. Season with salt, black pepper, cumin, and berbere and cook until vegetables have just softened. 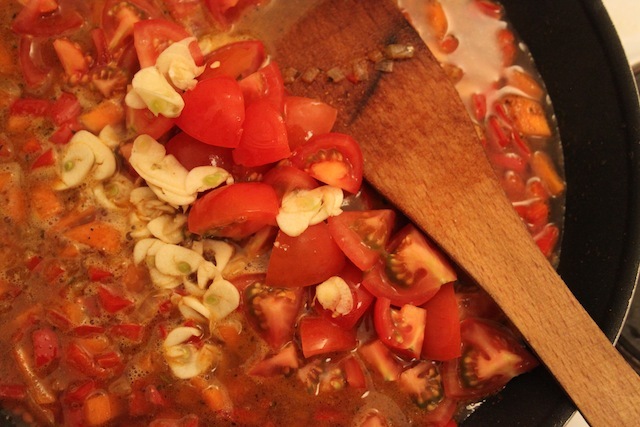 Add lentils to the skillet and stir to coat with spices, then add tomatoes, coarsely chopped garlic, and beef stock. Give everything a good stir and turn heat to medium low. Cover with a lid and allow to simmer until lentils have cooked through, about 20-30 minutes. Stir occasionally, and if it starts looking dry, add more water. Taste and adjust seasonings as necessary. Serve with basmati rice. 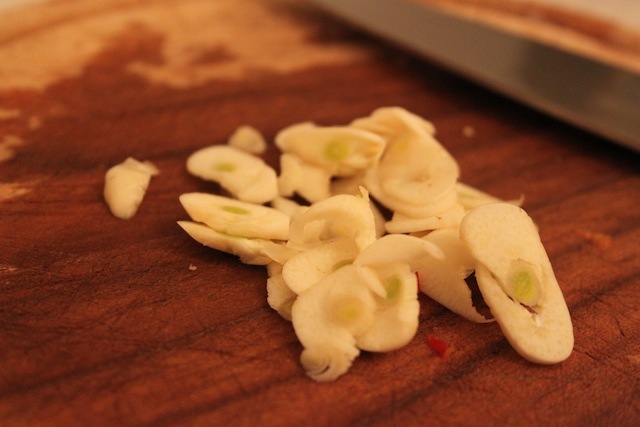 Won’t you take the green inner part of the garlic off?